The holiday season is already here and we are preparing to leave for our vacation. What to bring with us? If you are planning a trip to Italy, I would sure suggest leaving a little space for your shopping, but there are also some essentials you can’t forget. After living here for more some 15 years and having witnessed first-hand all seasons, I can definitely recommend what to pack for summer in Rome to enjoy your holiday and avoid surprises. 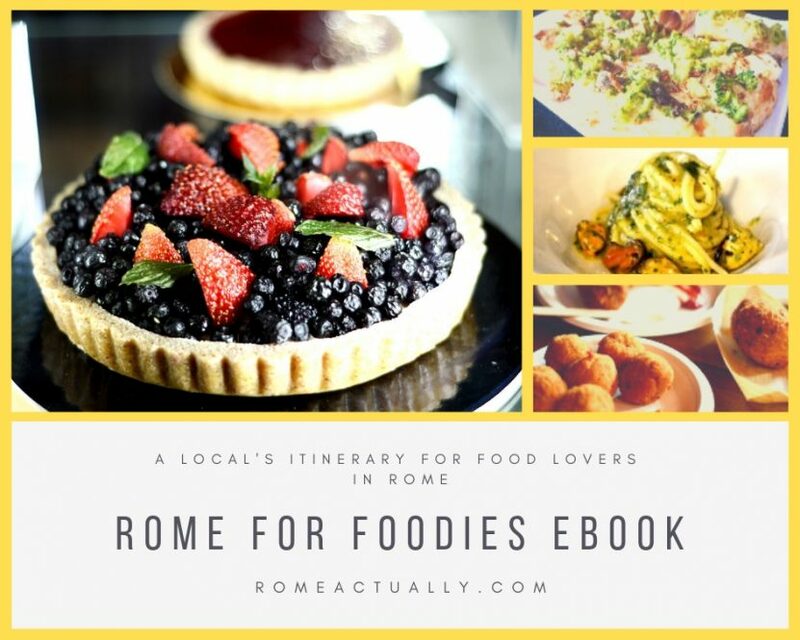 If it’s your first trip, check out our complete guide to the top Rome tourist attractions. In summer, the weather in Rome can be pretty extreme, and when packing you really need to take this into account. 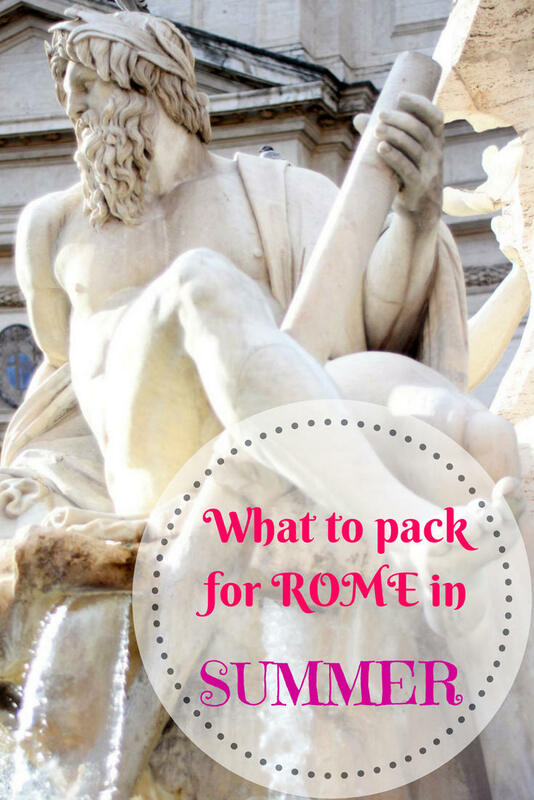 We concocted a perfect Rome summer packing list so that you arrive prepared and also know what to expect. Not surprising, right? Obviously in pharmacies, cosmetics and herbal shops, supermarkets and convenience stores you can find a sunscreen, but what if your hotel is not close to any of these and you need a sunscreen from the first day? It doesn’t harm to pack one already in your suitcase or even carry-on if the bottle is less than 100 ml. Also this you can find it pretty easily in Rome, but if you want to arrive prepared and avoid spending unnecessary money, we suggest packing a hat from home. You will need it when waiting in the line to enter famous landmarks (unless you book a skip-the-line admission) and also when wandering around the archaeological sites such as the huge Roman Forum, the Colosseum, the Baths of Caracalla or even Ostia Antica just outside Rome. Definitely something to wear in Rome in July and August. Definitely take comfortable shoes with you. With the cobblestones of Rome city center and the long walks you will take, your feet deserve something comfortable to rest on. Since it’s summer, I suggest you pack open shoes like the everlasting Birkenstock or walking sandals for men or women, or even walking shoes but made of light material. Walking a lot you will also be sweating, so I suggest cotton t-shirts instead of polyester or other synthetic material as your skin will need to breathe. With a cotton t-shirt or any other natural fabric, you will last all day, while with clothes in polyester, even if wrinkle-free, I don’t think you will feel comfortable after all day walking under the Roman sun. Summer weather in Rome is pretty hot, especially in the city center. So if you are wondering what to wear in Rome in July and August, I definitely recommend including some pairs of shorts in your Rome summer packing list. You can use them just about everywhere except in the religious sites. For this, you will need to wear something longer, which takes to our next point. Even if it’s summer and you are used to short light clothes, I suggest you also pack at least one pair of long trousers for when you visit the Vatican or other Christian sites, Catacombs included. They require modest clothing, so skirt or trousers below the knee and covered shoulders. If you don’t feel like wearing something long for the whole day and you can’t go back to your hotel to change, you can opt for a pareo to wrap your shorts in. I’ve mentioned this also in the general guide to packing for Rome but it won’t harm mentioning it again. Summer is a very busy season in Rome, so it’s totally pickpockets’ time. Be very careful with your belongings when on the public transport, metro, buses, and trams, and also when close to train stations, especially Termini, the main one. We strongly recommend including anti-theft travel clothes and gear in your Rome packing list for summer. Some of the items we suggest are an anti-theft hidden money travel belt, a pickpocket-proof hoodie and a scarf with hidden pockets. ⇒ Click here to check more anti-theft pickpocket-proof clothes. In summer, Rome has mosquitoes. Some areas more than others, but this is a pretty common issue all over the city. This is why a mosquito repellent is to be included when planning what to pack for summer in Rome. Most hotels will have their own system to chase mosquitoes away, be it air conditioning or protected windows, but you never know, you might need it in the night, or if you go to the beach or the countryside. I know, Rome is not exactly a sea resort destination, and even if it has some nearby beaches like Ostia and Fregene, I’m definitely not their biggest fan. However, many hotels in Rome have a swimming pool that you can use in summer, especially those outdoor, so a swimsuit is something you will need. Also, many hotels, not necessarily five-star ones, but also boutique accommodations like Hotel Lunetta, have a spa with sauna, Jacuzzi, hammam and other water treatments where you will need to wear a swimsuit. I suggest you pack sunglasses if you travel to Rome in the summer. To look more Italian, you ask? That, too, but because with such strong sun you will very likely need some protection for your eyes. An essential item to pack if you plan a trip to Rome. In Rome, you can buy a bottle of water just about every corner, but especially in tourist areas, they will be pretty expensive, sometimes paying 2 or 3 euros for a small bottle. In summer you need to stay hydrated in order to keep going, and water is possibly the most essential element. 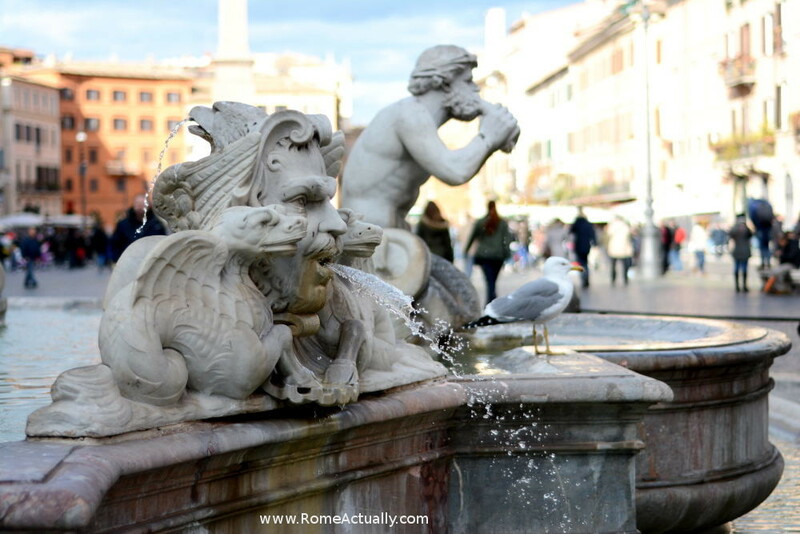 Plus, all around the city, you will find the famous “nasoni” (literally, big noses), the small fountains with constantly running water, so you can fill your bottle any time you want.